The fast-growing water sport at the beach is Stand Up Paddleboarding (SUP). This fun activity has really become popular in the past decade. Originating in the islands of Polynesia, it was picked up by surfers in Hawaii as a way of keeping fit while training for competitions. Paddleboarding combines surfing and kayaking, but is better than both as you can stand up on a board and use a paddle to propel yourself forward. It’s a fun, easy way to play on the water! With a minimum of equipment, you can paddle anything from ocean surf to the lakes and rivers—and best of all, no waves are required. And since you're standing at your full height, you'll enjoy excellent views of everything from sea creatures to what's on the horizon. It's almost like walking on water! 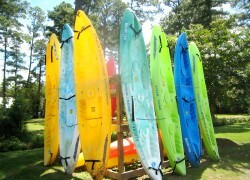 Looking to rent a paddleboard during your vacation at Sandbridge? 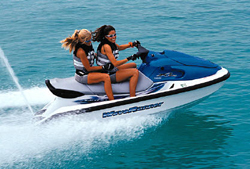 Call Moneysworth Beach Equipment Rentals at 800-662-2122 or place an order online at http://bit.ly/OzEQkV (under Water Sports). Local surfers are always chasing that perfect wave. It's what they do. So to save time, simply check with local surf shops or online sources for recommendations. www.swellinfo.com is a good site on wave conditions. If you couldn't bring your own board on vacation or don't own one and would like to give surfing a try, call Moneysworth Rental Equipment about surfboard rentals. 800-662-2122 / 757-468-3999 http://bit.ly/OzEQkV (under Water Sports). We list the best surf shops in the area under our Shopping Category (Click here) In our opinion, the best custom made boards around are by local surf legend, Bill Frierson of Frierson Designs. Check out his website at: Frierson Designs Bill has been referred to as "Chairman of the Board" in the surfboard industry for his unparallelled skill in shaping the perfect board. A true artist in every sense of the word. So it goes without saying, if you don't have a Frierson board in your collection, you're not a local. ECSC is North America's Oldest Running Surfing Competition and the second oldest continuously-run surfing contest in the world. Held annually in Virginia Beach, Virginia since 1963, ECSC is more than just surfing. Dozens of people also take part in other competitions including skimboarding, volleyball, an oceanfront 5K run, a swimsuit competition and the extreme sport of skateboarding. Live bands perform for free on an oceanfront stage throughout the weekend. A cost is involved to participate in competitions, but all activities are free and open to the public. is off Laskin Road, just five blocks from the oceanfront. Rentals include jet boats, ski boats, pontoon boats and equipment for skiing or fishing. 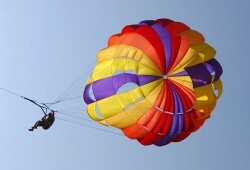 For full or half day rentals call 757-422-0079.